Having made two short documentaries of the Nazi party during her early flirtation with the Nazi, Leni Riefenstahl was courted and commissioned by Hitler to make a feature documentary of the annual Nazi Party Congress in Nuremberg in 1934 – the final film would become the controversial The Triumph of the Will, a hypnotizing propaganda film that was both lauded and loathed, polarizing both critics and viewers still today. Hitler arrived at the countryside received by crowd whose elation looked genuine and not staged. The scene set the tone for the rest of the film – Hitler, a messiah-like figure, raised from the rubble of the World War I, led and liberated Germany to her rebirth. Hitler’s appointment as chancellor from less than 2 years ago led to months of chaos in his party particularly the disintegration of the increasingly uncontrollable SA and its leader Ernst Rohm, prompting Hitler to tone down his racial policy and promote peace and unity. The film works with a hypnotizing power that one finds it hard to resist. This was obtained by powerful film language and innovative cameraworks such as aerial shots and tracking shots, which are taken for granted today but were extremely difficult back then. Hitler was often shot from an extreme low angle framing him with a God-like quality, intercut with close-ups of mesmerized faces of the audience. Special set was built so the grandeur of the Nazi architecture and carefully orchestrated rally could be fully captured. 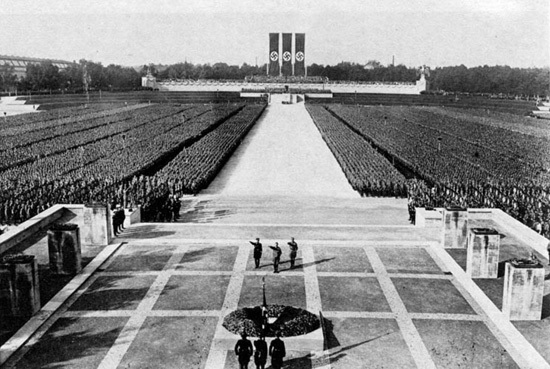 The artistic relationship of Riefenstahl and Hitler was at the height during the making of Triumph, Riefenstahl was given a large budget that allowed her to hire a crew of 172 people (unheard of by the standard of the days) and influence how the rally was designed for the movie. 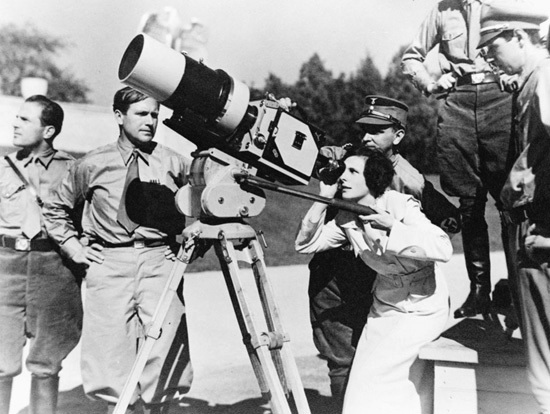 Triumph was critically acclaimed both inside and outside Germany, making Riefenstahl one of the most prominent female filmmakers in the history. She was subsequently vilified after the war that she was never able to make another movie again. She was prosecuted frequently after the war, she was still being investigated for denying the Holocaust still in her 100th birthday in 2002. Triumph raised the bars of propaganda filmmaking and documentary in general, although some would argue that it is not strictly a documentary as some scenes were reenacted in the studio. It is dull by today’s standards for it’s a tough job watching the Nazi talking heads speechifying 2 hours. The value of Triumph today lies mostly upon the historical value of the superbly filmed scenes of the Nazi rally and Hitler’s speeches. It also serves as a Faustian tale of an artist who seals the deal with the devil for the sake of arts. Triumph of the Will is directed by Leni Riefenstahl, starring Adolf Hitler, Hermann Göring and Max Amann. “Grizzly Man” is a documentary directed by Werner Herzog that chronicles the last years of a man whose life is driven by a dangerous obsession. Timothy Treadwell is the quintessential Herzog character. His life was directed by an obsessive purpose that suppressed a darker side within. His work only made sense in his own universe but most people would call him a maniac if not an idiot. He was only alive in the field doing his work that would eventually kill him. He is the rather unlucky real life version of Klaus Kinski’s character in “Fitzcarraldo“. Treadwell was the self-proclaimed guardian of the grizzly bears. He was the co-founder of the Grizzly People with his ex-girlfriend Jewel Palovak, which concerned with the treatment of the grizzly bears. Every summer he launched an expedition to the Katmai National Park and Preserve in Alaska. He camped there close to the bears as their “guardian” until they went into hibernation. During his last expedition, he brought along his girlfriend Amie Huguenard. They were attacked by a seemingly hungry and unfriendly bear which never met Timothy, killed and partially eaten. After all, it looks like the bears do not really need his protection. They are fairly safe, except some occasional disturbance from the hikers. They live in their own concealed world, and indifferent to everything else. One of the interviewees suggested that the bears found him harmless because they thought he was retarded or something, which was why he went safe until the fateful event. We can assume Timothy was up for it, how about his girlfriend? She was obviously frightened by bears, she went anyway because she loved the man. This is a rare documentary in which the director does not approve the actions of the protagonist. Timothy’s worldview is that of the disneyland – bears are harmless and his savior, and he is only normal among them, he is a failure from the human world. That casts a strong contrast to Herzog’s cold and logical view of the universe, which is full of cruelty and indifference, survival is the only rule. Timothy’s lifelong obsession, however, must have stirred some sort of connection to Herzog, for he is himself famous for his intense obsession – he pulled a large ship up to a mountain top somewhere in Amazon for the film “Fitzcarraldo”, with no trick photography, he really did hire a crew of aboriginals to do this stunt. In the very same film, he reportedly held a gun to Klaus Kinski so he wouldn’t leave the set. The incident is well documented in “My Best Fiend“. There is another film called “Into the Wild” directed by Sean Penn that deals with a similar topic – a young man disdains civilization that he runs into the wild, lives there for a short while until his eventual death from food poisoning. What makes “Grizzly Man” distinctive is that the director strips off the romanticism that often associates to the theme, and uses this to reflect his very own philosophy about man’s place in the universe. “Grizzly Man” is directed by Werner Herzog“, starring Timothy Treadwell who played himself. You are currently browsing the archives for the Documentary category.